John Lenehan has contributed to a project for the West One Media Group. 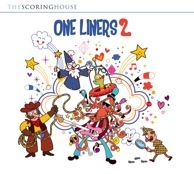 Called "One-liners", the brief was to compose musical cues (for TV and film) which last just 30 seconds. John's 22 contributions can be heard (in full!) by visiting http://www.westonemusic.com and typing "lenehan" in the "Music quick search" box on the left. "The Quiet Room" CD includes a new piece by John Lenehan called "Morning Song". A collection of pieces for flute and piano (grade 1-2 standard) inspired by gemstones. The publication also includes a CD with piano accompaniments and is lavishly produced with notes in four languages. Four books of short pieces from all eras selected by John Lenehan. In each of the four books that make up the Keynotes series there is a short piece by John Lenehan which includes an element of improvisation (Marching Tune, Transformations, In a Dream, Give me Five). Book one also includes a piece called "A Ghost in the Attic". A lullaby written for John's daughter and subsequently included in Julian Lloyd Webber's album "Cradle Song". Cadenzas for Mozart flute concerti K-313 and K-314 and concerto for flute and harp K-299 commissioned by Samuel Coles for his recording with the English Chamber Orchestra and conducted by Sir Yehudi Menuhin.